View More In Woks & Stir-Fry Pans. Cuisinart Chef's Classic Stainless Cookware makes everyday cooking tasks a pleasure. Healthful, high-heat stir-frying requires minimal oil and sears foods to seal in flavor, texture and nutrients. 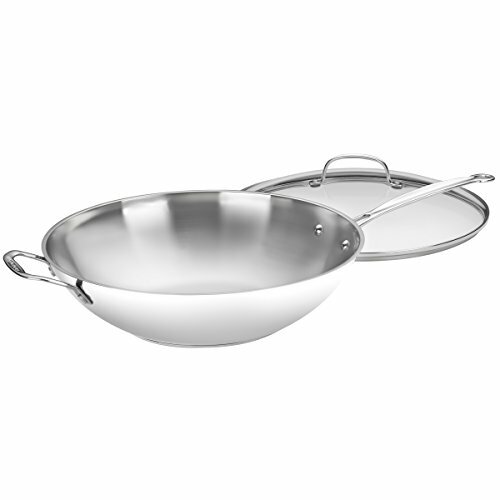 14-inch stir-fry pan made of stainless steel with encapsulated aluminum core. Stay-cool riveted handle and opposite helper handle for a secure hold. See-through glass cover with loop handle and stainless-steel rim. Dishwasher-safe for quick cleanup; oven-safe up to 550 degrees F.
Measures approximately 14-2/7 by 21-1/2 by 5-1/2 inches; limited lifetime warranty.